Combining well known classic dishes into one can often result in a new exciting menu option. The trick is to pick two dishes that go well together. This recipe incorporates Lasagne and Mornay but using chicken mince instead of beef in the latter. Adding KNORR Concentrated Liquid Stock into the mince brings flavour and moisture back into the chicken. Cook the onions and the chicken mince in oil. Add KNORR Garde d’Or Hollandaise Sauce, milk, KNORR Garlic Puree and COLMAN'S Wholegrain Mustard. Simmer and add KNORR Concentrated Liquid Stock to season. Thicken with KNORR Roux. 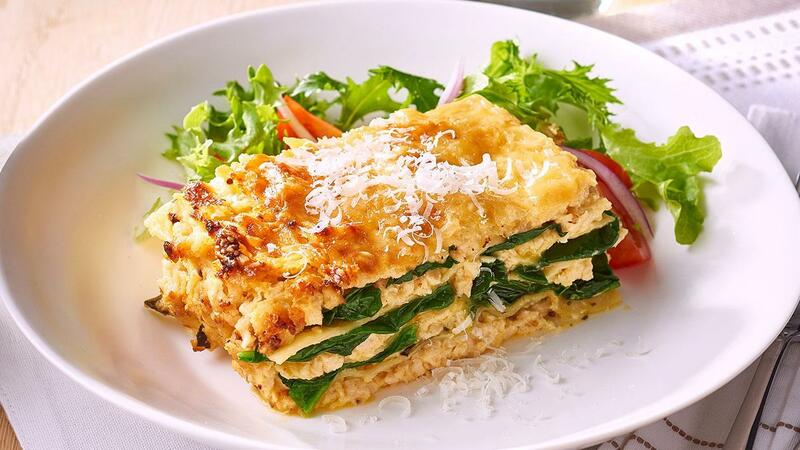 Pour some of the chicken mornay into a large gastronome and add a layer of lasagne sheets. Repeat this process four times and include the cheese and spinach in every second layer with a cheese layer to finish. Serve with crunchy fresh salad on the side and crusty bread.